Note! These are first results of the automatic location system. The earthquakes have not been interactively analysed. 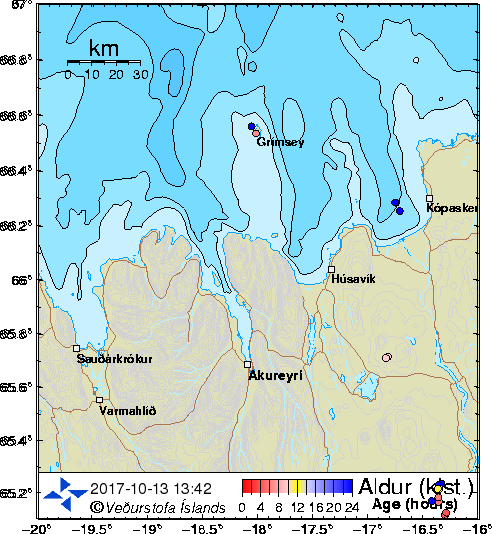 Locations of earthquakes in Tjörnes Fracture Zone for the last 48 hours. The image is refreshed every 2 minutes. The circles on the map represent earthquakes for the last 48 hours. The colors of the circles represent the time since the earthquakes occured (the numbers below the color palette show hours). The latest earthquakes are shown in red and the darkblue ones are 24 hours old or more. The earthquakes stay blue until they are 48 hours old, then they disappear. Earthquakes bigger than M3 (on Richtersscale) are represented with green stars. Black triangles represent seismic stations (the SIL system) and brown lines show roads.